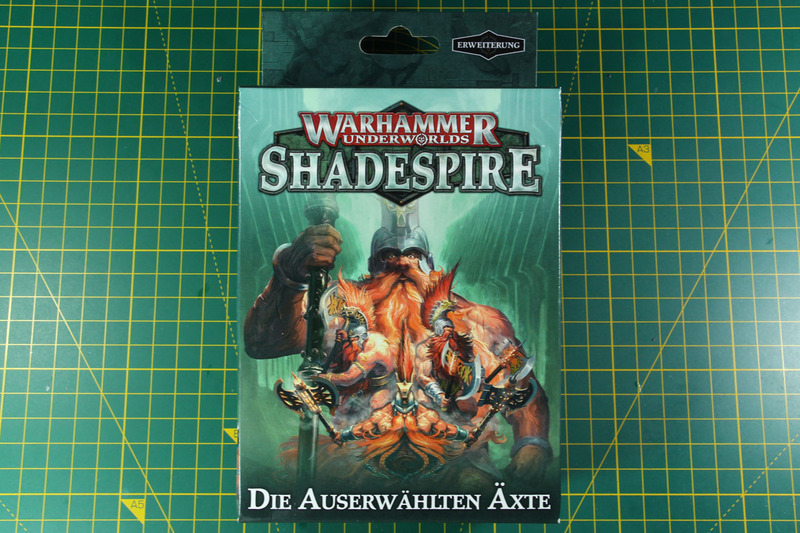 The Chosen Axes is a warband expansion for Warhammer Underworlds Shadespire with four Duardin Fyreslayers and costs 22.50 EUR. 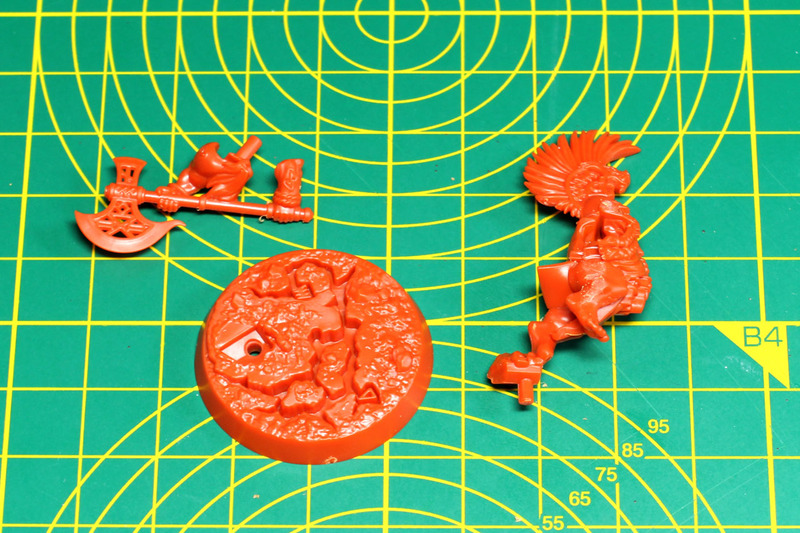 It comes with two fiery-orange pre-coloured sprues, a card deck and brief instructions on the assembly. 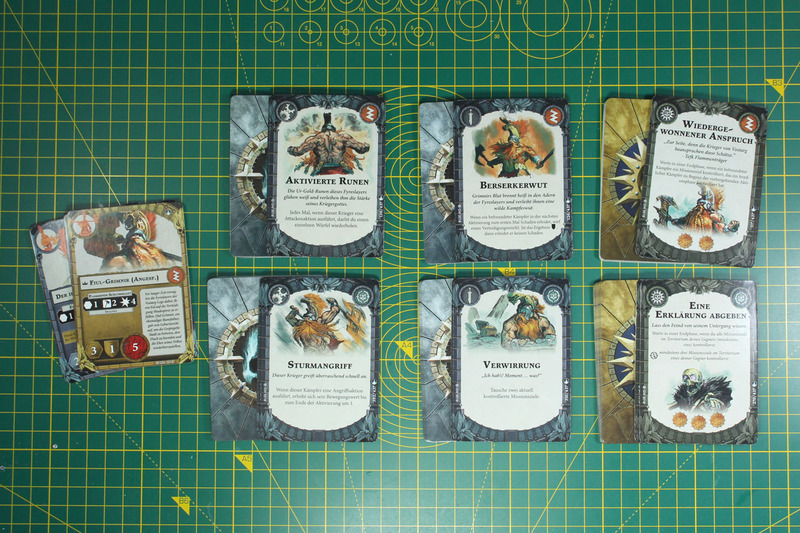 The card deck covers 64 cards, 4 cards for the warband itself, 29 are unique cards for the Fyreslayer warband and 31 universal cards (split across objectives, upgrades and ploys) to be used with any Warhammer Underworlds warband. 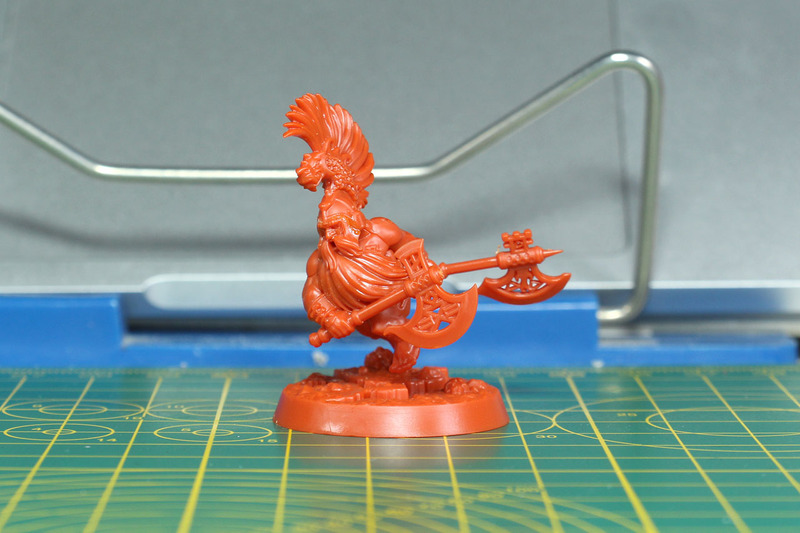 Like all Shadespire miniatures, the Chosen Axes are push-fit as well. 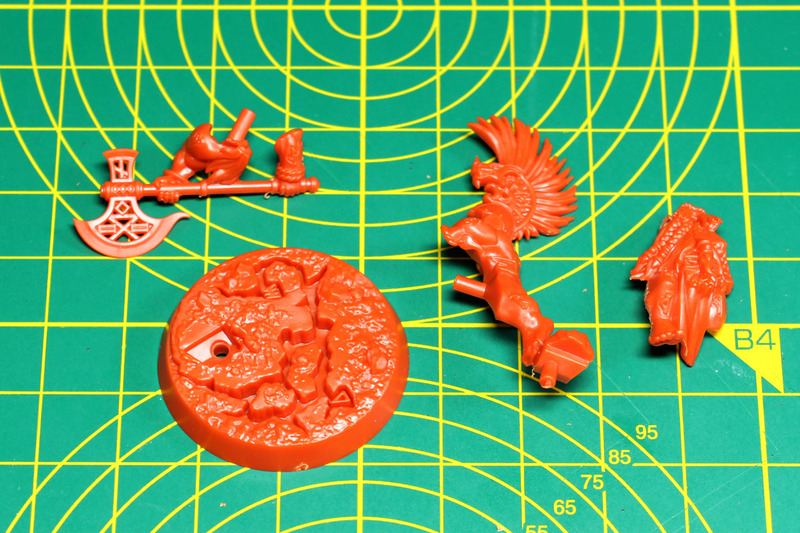 So these miniatures can be assembled without the use of glue. 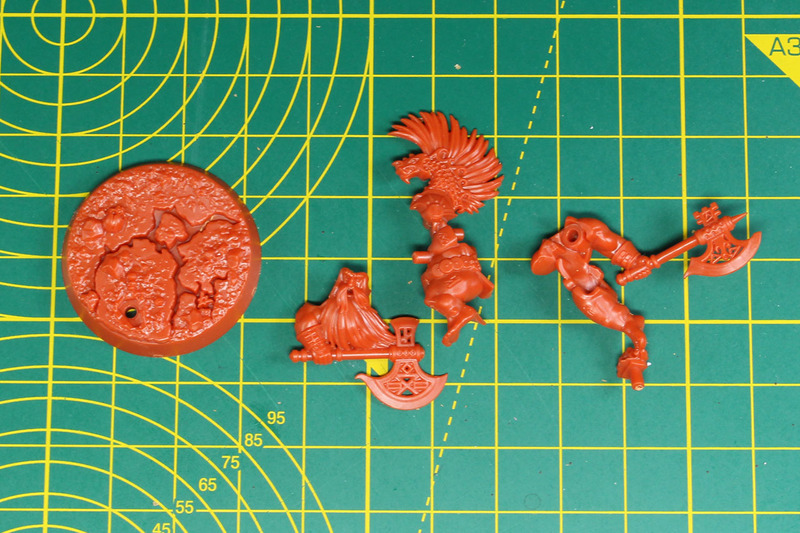 All of the four Fyreslayers have pre-sculpted bases, so all you need is brushes and paints to complete the miniatures, no PVA, glue or flock (or at least optional). The orange plastic handles the same way as the "regular" grey plastic does, it works with plastic glue, primer and colours as you know it. 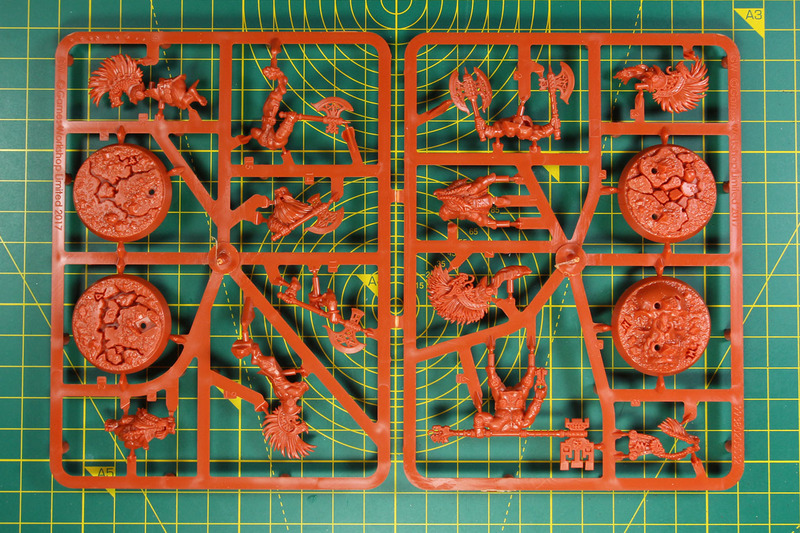 The cast of the sprues is very good with crisp details and proper use of frame. 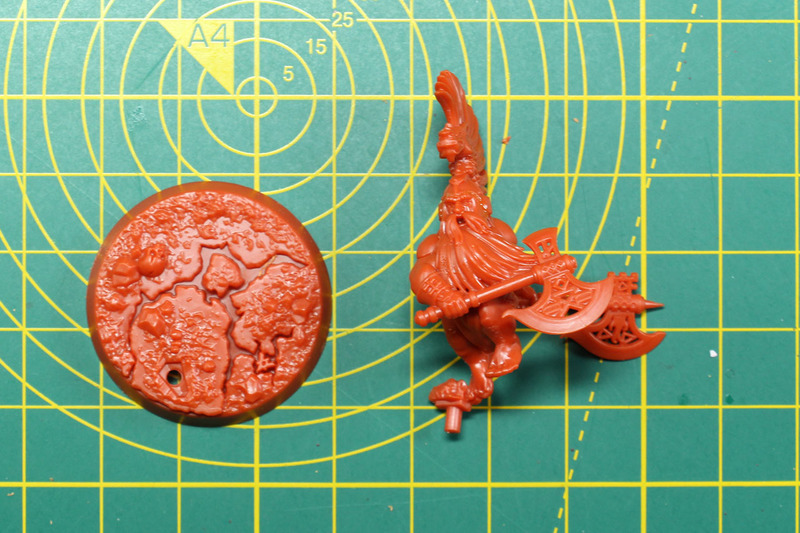 Some of the smaller parts, like the keys or braids are delicate, so be cautious while removing them from the sprue. The leader of the Chosen Axes is Fjul-Grimnir. He is a former Runefather of the Vostarg lodge, who swore an oath to protect the city of Shadespire. After the Fyreslayers of Vostarg failed to keep their oath, Fjul-Grimnir sacrificed his birth right to enter the mirrored city to restore the honour of his lodge. Once Fjul-Grimnir is motivated, he gains an additional point of movement and wound, along with a deadly upgrade to his Latchkey Grandaxe. Fjul-Grimnir stands upon the remains of a giant's skull and wields a double-handed axe, a Latchkey Grandaxe. The right hand of Fjul-Grimnir is Tefk Flamebearer. He carries two single axes, a fyre basket axe and a fyresteel axe, once he gets inspired, those turn into fiery axes. Mad Maegrim goes dual wielding like Tefk. He carries two Fyresteel Axes, which turn into seering axes after being inspired. 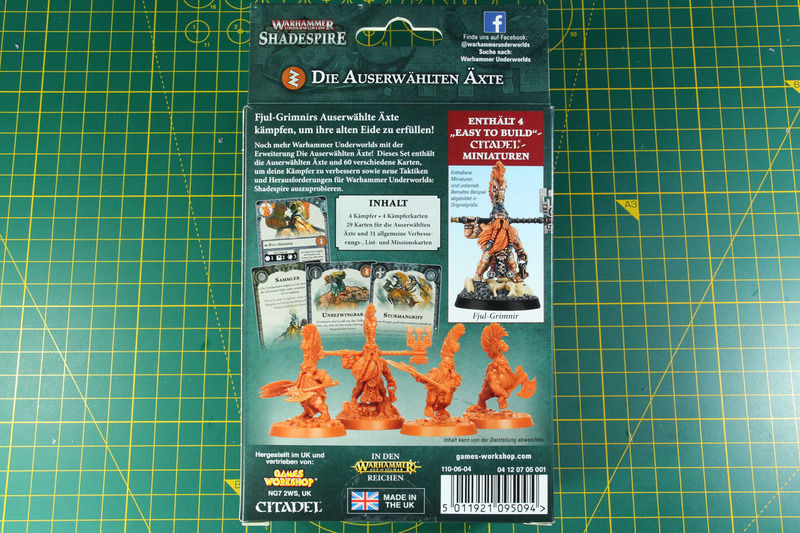 Vol Orrukbane is the oldest member of the Chosen Axes and carries a Fyresteel Great Axe that he swings with both hands. 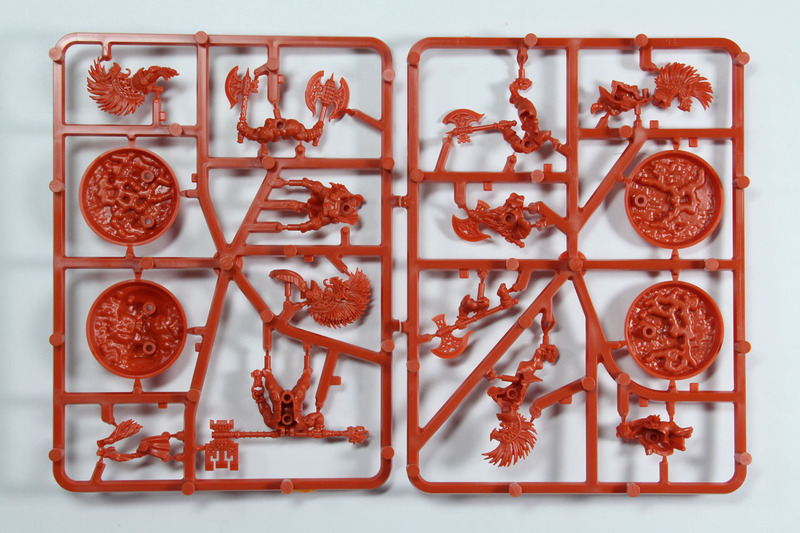 As you can see in the round up below, quite the dynamic poses on the Fyreslayers. 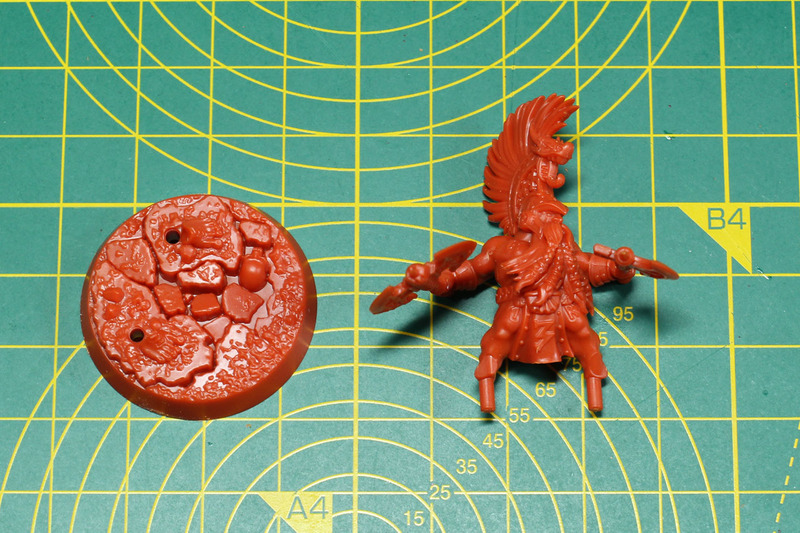 This is one of the benefits of the new Age of Sigmar basing. Regiments looked cool, that is true, but on round bases with an inch between the miniatures, you have much more room for dynamic and action driven poses. 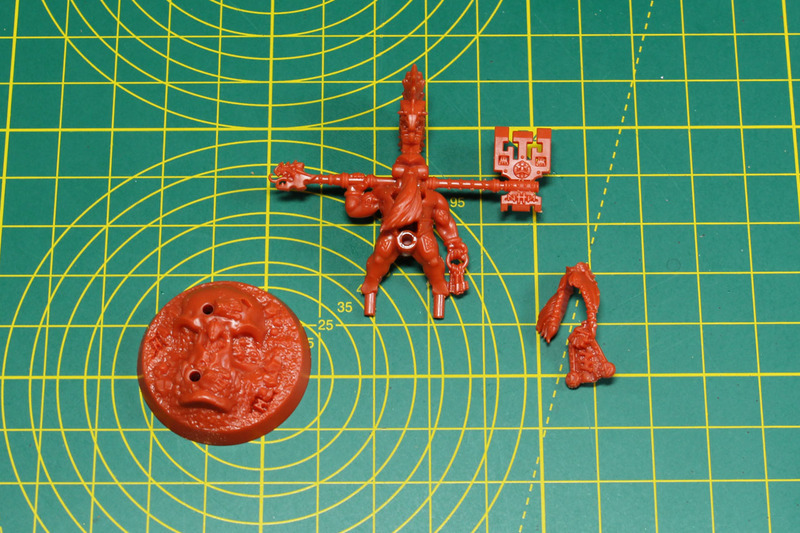 Especially for armies like the dwarves, where the stout warriors were set on 20mm square bases. 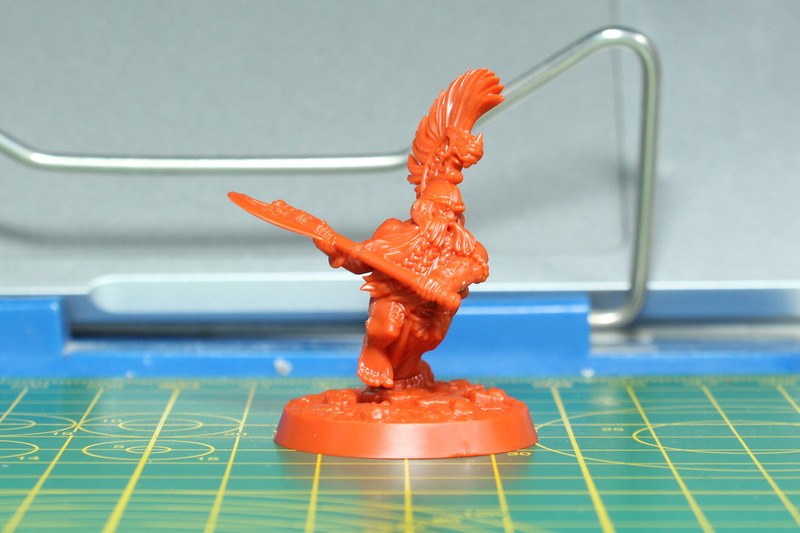 Of course not only the Duardin benefit in design from this change, but broad shoulders, a stunty build and large weapons give you a hard time on such a small "foot print" to do a proper pose. 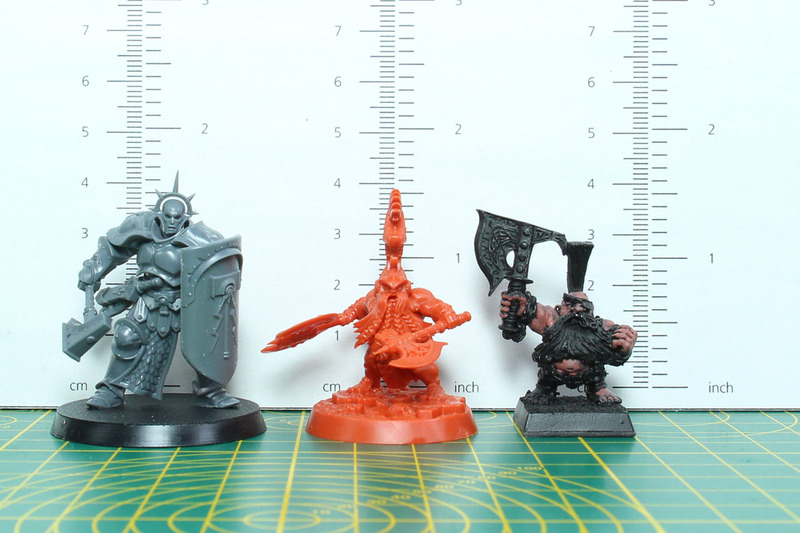 The Fyreslayers are compact warriors and therefore the Stormcast Eternal noticeably towers over the latest incarnation of the dwarven slayers. The scale is still fitting with clearly dwarvish proportions, but became less bully. Right next to him you can see the miniature (from WHFB 4th edition) of one of the most famous slayers of the Old World, Gotrek Gurnisson. 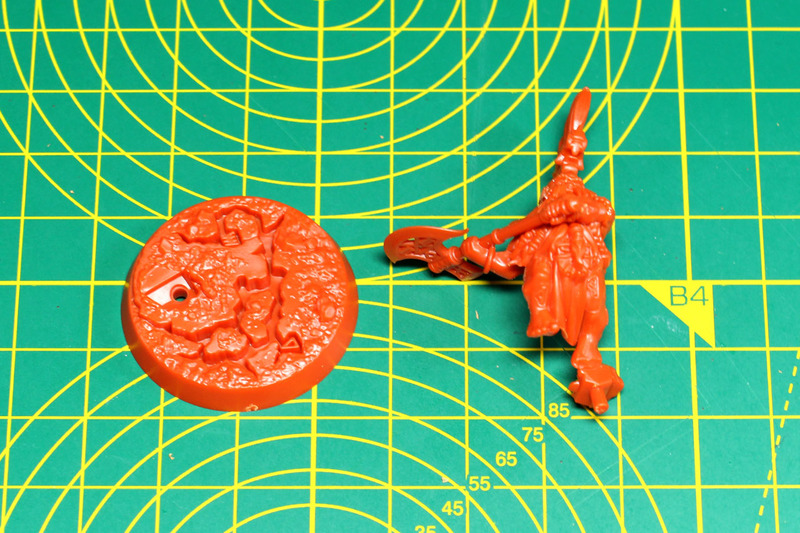 Compared to the regular rank & file slayers, Gotrek has the benefit of being a character model and therefore was sculpted a bit more dynamic. I do like the idea of triggering the inspiration of the Chosen Axes by standing on an objective by the end of the round. Along with the background, as they are searching for the Ur-Gold, this is a very lore-driven feature and ties in the stubborn nature of the Duardin. "Once we claim this spot, we're not going to retreat". Being inspired gives them another wound all across the warband and gives them one more movement, along with the usual more effective attacks. With this condition building your deck around the objective cards from the starter kit that are activated by holding the objectives, is one way to go. In combination with power cards like treasure lust, it brings your warband into action. 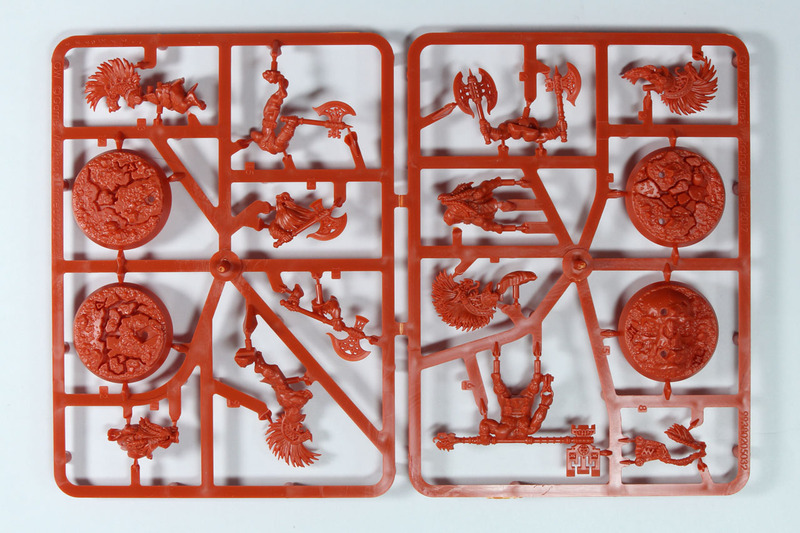 But keep in mind, without being inspired the Fyreslayers are rather slow with only a movement of 2, so you have to place objectives and models wisely. 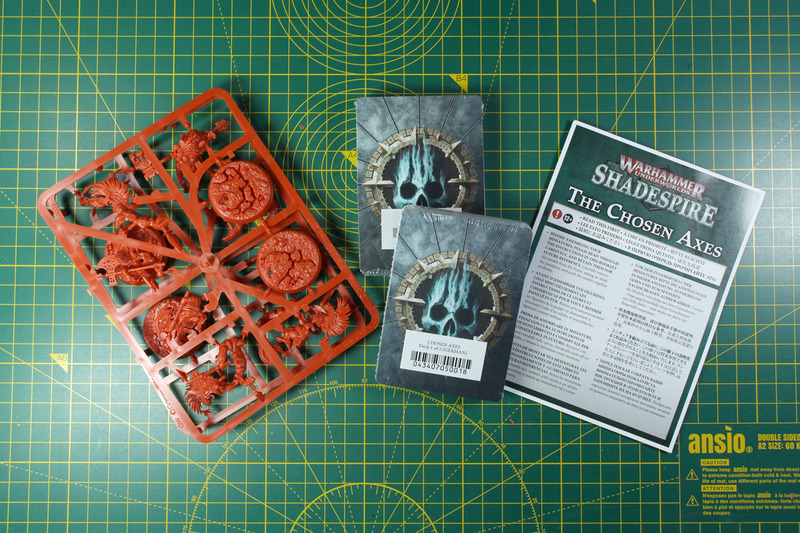 As the community page of Shadespire covers several deck builds, the Warhammer World Grand Clash Top deck for the Chosen Axes does just that. As the strategy for this warband is very clear, they are more challenging to play - at least against more skillful enemies. Your opponent will try to deny the objectives from you, stretch the board and / or will build narrow gaps and keep you from upgrading your warriors. So play aggressive, but not without focus. An inspired Fjul-Grimnir is a terrifying leader, with 5 wounds and the ability to deal 4 damage with a single attack. Especially the later makes him incredibly deadly, as no other leader is able to deal that much damage in one blow. 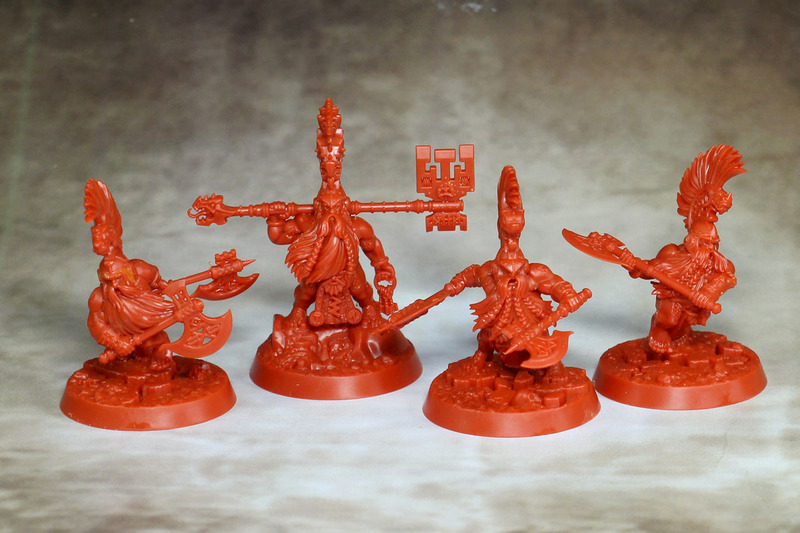 The whole four Duardin warriors of the Chosen Axes. As mentioned above, it is refreshing to see more dynamic poses along the dwarf / Duardin range. 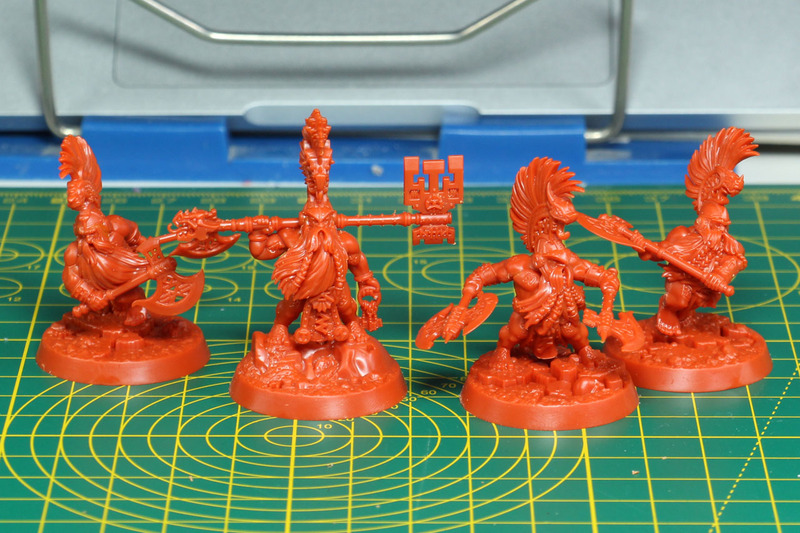 The Chosen Axes are more or less a small unit of Vulkite Berzerkers with a character model leading them. 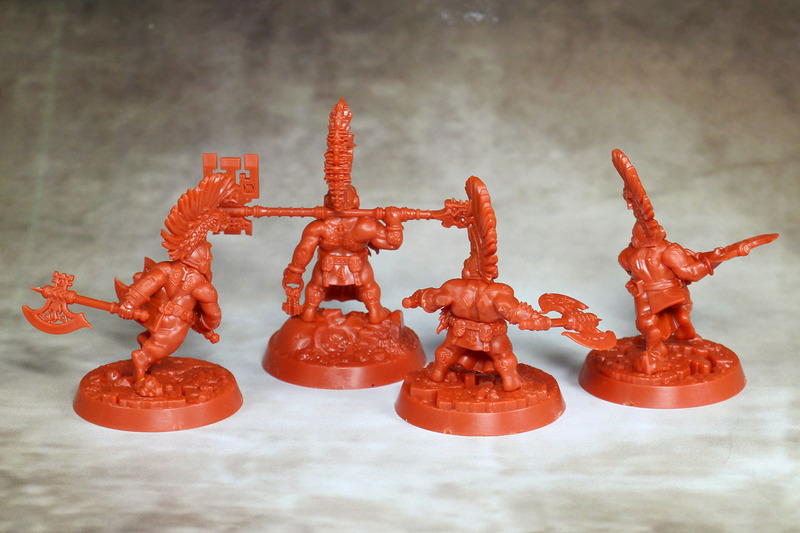 Therefore the price of 22.50 or 20 EUR for the box without the Shadespire content is on eye-level with the regular AoS unit of the Vulkite Berzerkers (10 miniatures for 45 EUR). Yes, the Chosen Axes are push-fit, but are more dynamic compared to the Berzerkers. You could argue, that with these being such an elite squad around Fjul-Grimnir, why are there no Flamestrike Poleaxe along the weaponry, maybe at least for Tefk, the loyal right hand of the warbands leader. 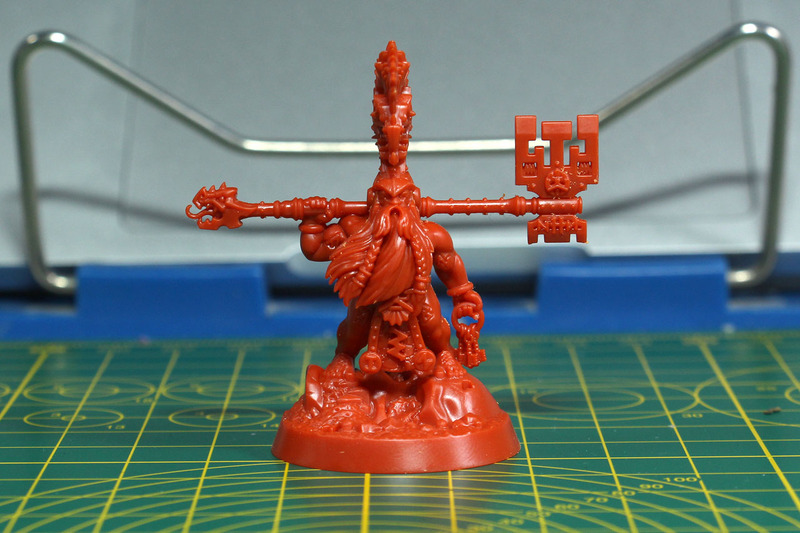 Or more fierce looking, with a Fyrestorm Greataxe like the Grimwrath Berzerker. Long story short, for such a legendary group, the weapons beside the Latchkey Grandaxe could be a bit more epic for my taste. The production quality is great on the casting. It is difficult to split the heads, with the helmets, Mohawks and braided beards, but they did it quite convincing without losing detail. 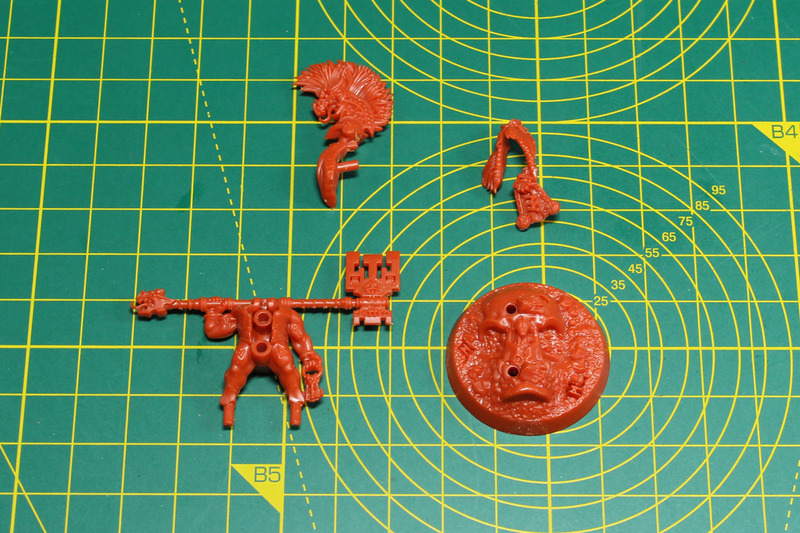 Some pieces were a bit tricky to assemble, as you don't want to apply to much pressure on the parts for the push-fit, because the fine details might bend or get blunt. 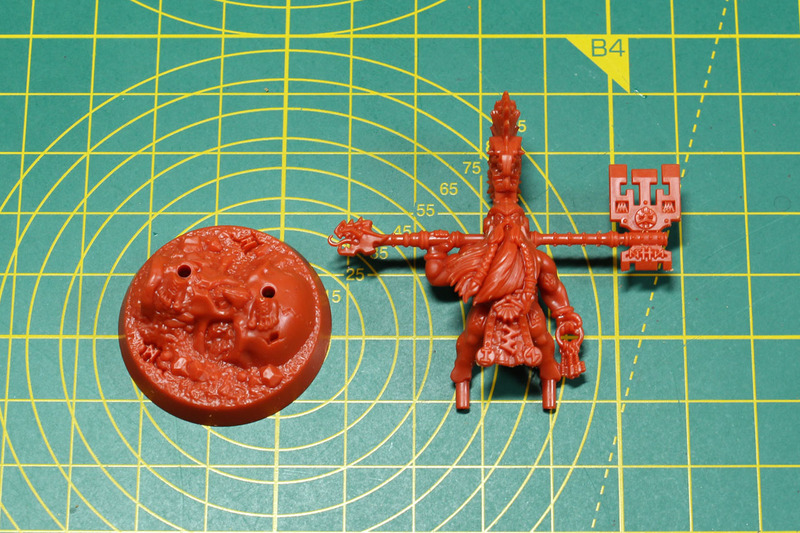 So I suggest a dry-fit and assemble them the "old way" with glue and trim off the pin and sockets beforehand. Some of the card edges were a bit bruised, but nothing that would really worry me, as I have them sleeved. 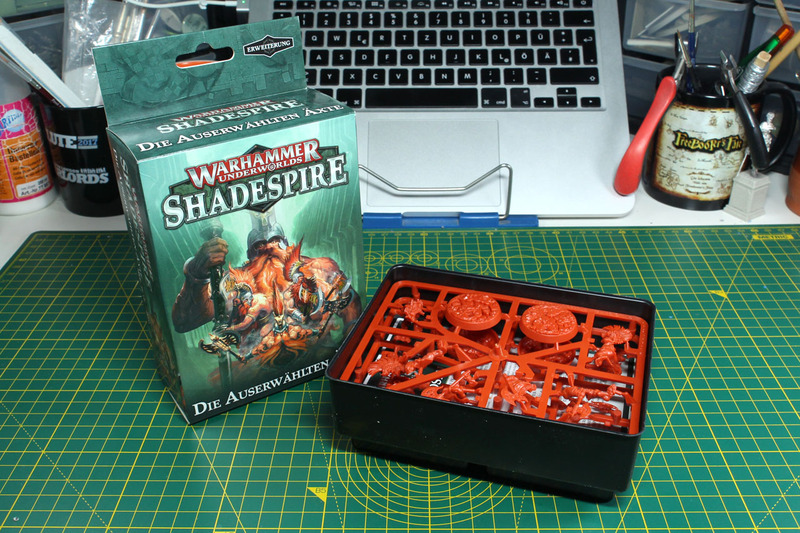 If yours should have any uncommon damage, get in touch with the customer service, Games Workshop is usually top-notch in that department. 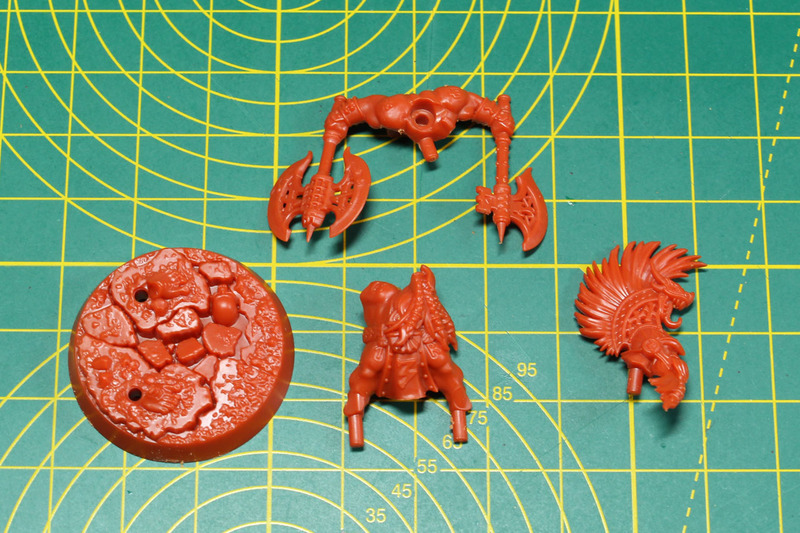 From the design, the Duardins, but especially the Fyreslayers have become more mature, more grown up. 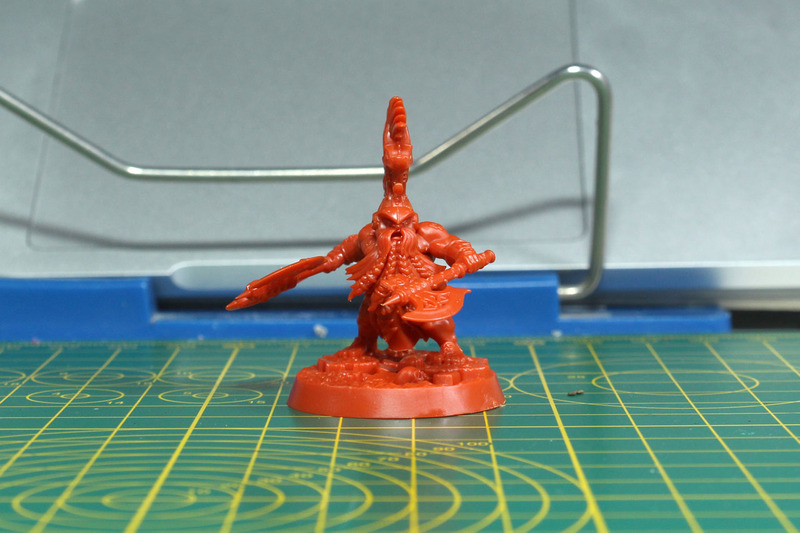 The newer sculpts have more realistic proportions, look more serious and have less overdrawn features. 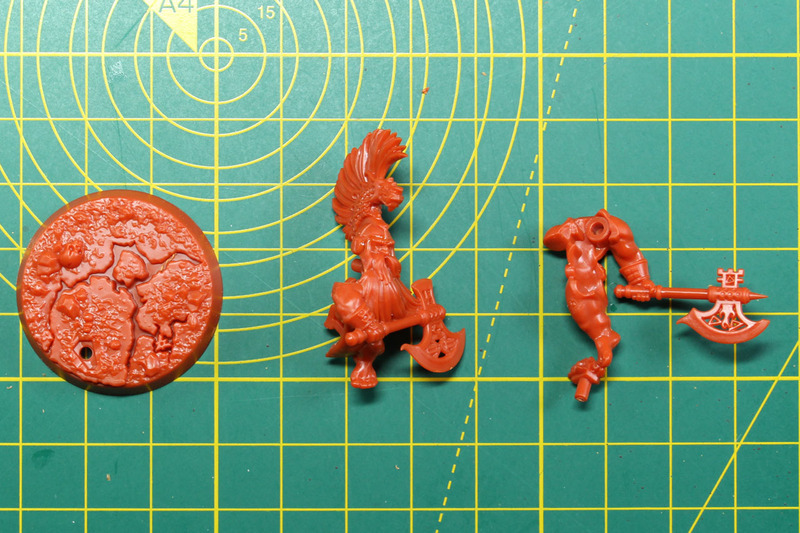 For decades the design of the dwarves was characterized by the sculpts of Colin Dixon. A slightly cartoonish style, with broad noses and red cheeks. A design that was unmistakable and popular. 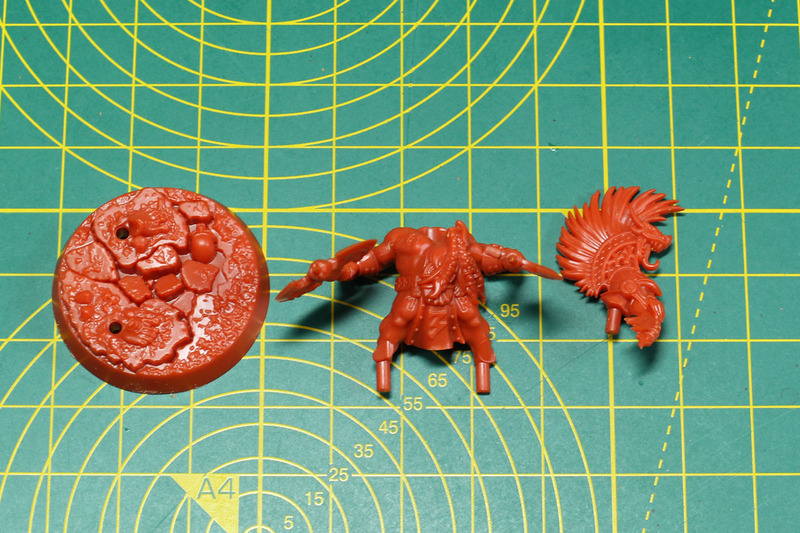 The Dispossessed of the Age of Sigmar range have a mixture of both, the newer sculpts of the Hammerers / Ironbreakers and the older warriors.